Philadelphia 76ers guard T.J. McConnell reacts with center Joel Embiid after scoring against the Boston Celtics during the third quarter of Game 4 at Wells Fargo Center. 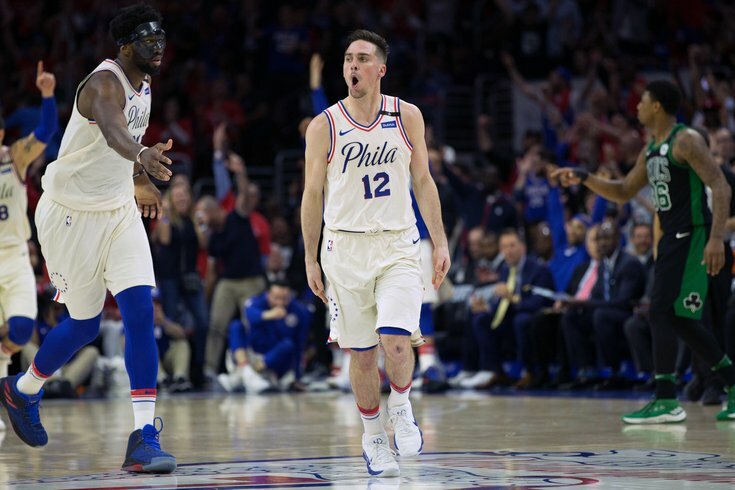 If there was ever going to be a role player that would save Philadelphia's season, didn't it have to be T.J. McConnell? The guy who quarterbacked the team through their 10-win season, the guy who was written off several times — including as recently as the end of this season — and the guy who has never backed down from a challenge that we know of in his life? There are many reasons the Sixers won a do-or-die Game 4 against the Boston Celtics, but it was McConnell's replacement of Robert Covington in the starting lineup that very obviously deserves the spotlight. Brett Brown pulled McConnell in the guts of Game 2 in Boston in order to turn back to Ben Simmons, and in the days since has insisted he wasn't too interested in going to McConnell at the one with Simmons on the court. Desperate times call for desperate measures, and McConnell rejoined the starting group to great effect: 19 points, seven rebounds, five assists, and the complete command of the crowd throughout the evening. Chants of "T-J! T-J! T-J!" echoed through the arena during the fourth quarter, as McConnell was rewarded with a standing ovation to accompany his return to the bench. From the symbol of a 10-win team to the team's spark plug in a must-win playoff game, McConnell's night guaranteed a return trip to Boston for the young Sixers and a glimmer of hope as they prepare for the road. "It is just something not everybody has, that fire within," said Ben Simmons. "He's not the biggest or most athletic guy, but he has an energy that he brings every night and is a huge part of this team. Tonight was a night where he really stepped up. He gave us the energy that everyone else was able to feed off of." The decision to turn to McConnell looks obvious now, but it's a lot tougher to make the call given the body of work this group has put together. Philadelphia had the most productive five-man group in the league this season in their starting lineup, and if Brett Brown elected to stick with that group in a must-win game, he would have had plenty of data to point to in order to justify the call. The decision came at the last possible moment, with all the involved parties explaining that the coaching staff shared the news during their day-of walkthrough for Game 3, around 2 p.m. Not exactly a lot of time to infuse someone into a starting group and figure things out. What aided McConnell in the transition was the volume of minutes he has spent playing with these guys all year, and the ferocity he plays with that has been a constant all throughout his career in Philadelphia. Though the knock on a guy like McConnell is that his 100-mph act means you're seeing the ceiling of his play more often than not, that mentality also means he's not going to be daunted by stepping into a playoff starting lineup with four hours of prep time. This would have just been a cute story lost in the depths of Sixers history if McConnell came out and had a clunker, but he was integral to their victory over the Celtics. It's something we've been stressing here all year, but one of Philadelphia's major problems on offense has been the lack of dribbling available on the court at any given time. That sounds ridiculous to say about a professional basketball team but is no less true — the Sixers' sets are limited in part by a lack of shake from their guys on the perimeter. McConnell's inclusion in the lineup negated that problem. The Sixers did not exactly burn down the building on fast breaks, scoring just three points in that fashion, but they had a little easier time with shot creation than they have elsewhere in the series. The immediate beneficiary was Simmons, who continued to struggle when creating his own shot but benefitted from being able to play away from the ball and focus on getting into the right positions off of McConnell. Just as important as his production on offense was his work on the defensive end of the floor, where McConnell hounded Terry Rozier all night long. Boston's point guard had feasted on different matchups throughout the series, but he was relatively ineffective on Monday and it took some of the sting out of Boston's starting group. Dealing with McConnell playing defense for all 94 feet is not even a little bit fun. In fact, McConnell outright won the matchup with Rozier (and by a fairly decent margin), which went a long way toward getting the victory for Philadelphia. Boston's strategy of just staying home on guys one-on-one has worked okay when Philadelphia has an absence of ballhandlers on the court. But McConnell roasted Rozier on a few occasions and Boston never really adjusted to the tempo he played with when the ball was in his hands. "He just did his job," Joel Embiid said after the game. "He didn't take any plays off, he was pressing full-court the whole time, doing his job, running the offense, getting guys involved, making shots, layups, and just doing his job." It makes it a little easier to make a dramatic change like this when you have the type of people who are prepared to do whatever it takes to win. And on both sides of the equation, the decision was met with the camaraderie you might expect from a tight-knit group. "I said anything to help us win at this point, and obviously it worked," said Covington. "I said coach, anything that will make us win at this point ... it's about adjustments, and at this point we found something that helped us win, so whatever happens from here on out, we have to stick to what's successful for us." "Rob's one of the best dudes I've been around, very selfless, and he went out of his way to come up to me today and said, 'You're starting, go out there and make a difference.' That means a lot coming from a guy that you took his starting spot," said McConnell. "We don't really look at it like that, but he didn't have to do something like that, and it just kind of speaks volumes to what kind of guy he is." Those two guys have been together longer than most of the players on this Sixers roster. Along with Richaun Holmes, they had to go out there and get beat up during that 10-win campaign, so they have a special appreciation of what it takes to be on this stage and just how tough times can get. There is something about this group that allows a change like this to happen and not just work, but become an overwhelming success. A belief still exists around the team that the Sixers can pull off what has historically been impossible. Embiid wore a shirt with the message, "HISTORY WILL BE RE-TWEETED" written in bold, black letters on the back, a suggestion that the team refuses to concede that a 3-0 hole can't be climbed out of. Their spirit, as Brown has constantly talked about over the last two days, remains high. Embiid is still trash talking after big defensive plays, Covington is still flying around on defense and taking shots that prompt groans from the home crowd, the shooters let it fly in the face of miserable results. That's who this team is. And so when the coaching staff made the call to turn to McConnell, these guys didn't really bat an eye at the change. Asked about whether the starting group was at all unsettled by their A1 group getting split up in the team's final hour, JJ Redick said nobody in the locker room blinked. "I think it was just Brett trying to make an adjustment and inject some life. We wouldn't be where we are without our entire team. That's the beauty of basketball, just being on a team and being able to sort of sacrifice for each other," Redick told PhillyVoice following the game. "There are games – I can't remember what game it was in the Miami series that I didn't close it out. You're just trying to win a game. That's the focus right now, so I'm not surprised [everyone handled it well]." With Simmons struggling and Brown taking the brunt of the criticism, Saric's play in this series has flown under the radar as a major reason for their struggles. Saric's ascent this season was a critical component in making the starting lineup work, and his failure to deal with Boston's athleticism hurt Philadelphia at the worst possible time. He didn't get any longer or more athletic in the time between Games 3 and 4, but Saric found a way to get going on Monday through sheer force of will. The Sixers kept feeding him on the block early in the game, in what looked like it was going to end disastrously for the home team. Boston was happy to use single coverage on him down low and use their athletic advantage to deter Saric at the rim. In his typical fashion, "The Homie" twisted, turned, and shimmied his way into succeeding anyway, pouring in a game-high 25 points in what was probably his best game of the playoffs to date. His success in this game can be boiled down to a 50/50 split: at least half of the equation is him simply making shots, while the other half can be attributed to Saric taking the game to Boston and making them feel his presence. His three-point shooting still hasn't come back around, but the Celtics continue to respect him as a threat from that area of the court. It makes all the difference in the world for Saric as a driver. He's big and bulky enough to finish through contact when he gets a defender on his hip, which he did to Marcus Morris and Jayson Tatum alike in the second half. Decisive Dario™ is a completely different player, and with some of the scoring drying up for Philadelphia in this series they need their core guys to shoulder a larger responsibility. With the season on the brink, Saric delivered, and summed up the team's mindset during his postgame chat in the locker room. "After you're down 3-0, you come on the court and fight and try to follow the game plan," said Saric postgame. "We can't lose anything. We took the taste of how it feels on the court after losing. From 3-0, now it's 3-1. We need to play play-by-play. Every game is a special one, and we treat it like that the whole game." It remains inexplicable that Aron Baynes is making three-point shots in this series at all, because there is basically no precedent for him taking them in high-leverage situations. He had taken a total of 29 threes in his career entering the playoffs, with just one of those coming during a postseason appearance. Through three games against the Sixers, he had made more three-point shots than the rest of his career combined. The Sixers have decided to test whether that's sustainable, or whether he remains Aron Baynes. Boston's starting center still made them pay a couple times on Monday but the decision to funnel toward him ultimately was a net gain for Philadelphia's defense. Baynes took six three-point shots against the Sixers on Monday night, which are six possessions Philadelphia probably feels are a win regardless of the results. Game-to-game these plays can swing wildly and you can't count on NBA players missing open-ish shots for an entire series. But hey, if you're going to try to force anybody into carrying Boston's offense, that's the guy to pick. With a late-arriving crowd and a team coming off of back-to-back heartbreakers, it would not have been a shock to see the Sixers fold in Game 4 and call it a season. The task ahead of them is daunting, and the No. 1 seeded Raptors completely crumbled in their final game of the season in the same position on Monday — albeit in a road game, and against LeBron James. But even with people anointing them as one of the teams expected to dominate the next decade, the Sixers were not content to hit the beach and be content waiting until next year. And that starts with their young leaders. "I'm not ready to go home and start my vacation, definitely not," said Simmons. "I texted Jo before the game and we spoke about it. We want to be here. We believe our time is now. It's going to take a lot, but that's just the way our mindset is – we know we're the leaders of this team"
Sometimes, being a leader means finding a way to get it done when your best stuff isn't working. With his finishing still an issue at the moment (he and Embiid had matching 6/15 nights from the field) Simmons got to work on the glass and on defense, doing his best to deter Boston in any way he could. Embiid followed suit with what was the best defensive performance he has had in the series to date. And for the first time in this series, we got a reminder that these two can be the biggest, baddest dudes on the court when they want to be when the Sixers ran back-to-back pick-and-roll plays that ended with Simmons tossing up lobs to his partner. They weren't the cleanest of plays — I'm not so sure that wasn't passed directly in, or if it was offensive interference as the Celtics' reaction seems to suggest — but there's no excuse for these guys to shy away from running this sort of offense. Being bigger and more athletic than your matchup only matters if you actually take advantage of it. It all starts with these two. Brett Brown can make all the adjustments he wants, and the players around them can do whatever they can to contribute to the cause. But the Sixers will ultimately go as far as this young duo can take them. And for now, at the very least they sound like they're ready to continue taking the fight to Boston.